One of the most counterfeited brands in the world just got harder to fake. New holograms and more sophisticated patterns make the Cohiba Behike’s band nearly impossible to reproduce accurately. Like fine wine and fine art, it’s inevitable that fine cigars will be counterfeited as well—perhaps none finer than the Cohiba Behike. Expensive, high-profile smokes like the Behike are always going to be subject to the unscrupulous world of illegal reproduction. This is an unfortunate and undeniable reality, which is exactly why global distributor Habanos S.A. and Vrijdag Premium Printing in the Netherlands have just released an updated band for the Behike BHK series. The new holographic label is now produced with even more complex imagery than before, making it markedly difficult for counterfeiters to duplicate. While the overall composition of the new Behike bands remains the same, the primary difference is the security strip on the back, which has a redesigned and modernized repeating holographic pattern. 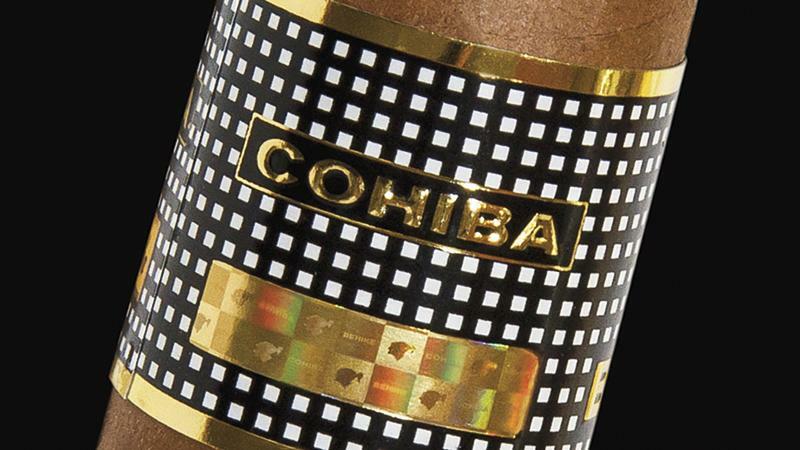 The pattern still consists of Cohiba’s trademark Indian head profile and the Behike insignia, though its arrangement has changed. When the Cohiba Behike BHK first came out commercially in 2010, the band alone was a technological innovation for the cigar market. Full of complex impressions and intricate trim, the bands were encoded with holographic emblems put in place for the sole reason of thwarting fakes. This pioneering security effort marked the first time that 3-D type images appeared on Cuban cigar bands. Not only did the gilded bands have a glittering “wow” factor for consumers, but the advanced design made unauthorized reproduction difficult in a way that forgers and knock-off artists had never seen. This, however, did not stop them from trying. Shortly after the Behike’s release, fakes began to surface everywhere from the beaches of the Bahamas to the private poker rooms of Las Vegas, even before Cigar Aficionado magazine named the Cohiba Behike BHK 52 the Cigar of the Year for 2010. Habanos is doing its part to ensure that smokers get genuine product, but education is also key. In the case of the Behikes, there are a few simple and common-sense rules to keep in mind. Firstly, Behike BHKs do not come in boxes of 25. Many counterfeiters make this mistake over and over again, hastily packing Behikes into crudely painted, 25-count boxes. This is an immediate incrimination. Behikes only come in boxes of 10, and the boxes themselves are finished with a luxuriously thick, high-gloss piano lacquer. The lids are solid without ridges or collars and do not have brooches. Inner hinges are branded with the words “Cohiba” and the bottom of each box has a smooth swath of felt rather than an exposed wood grain common to other brands. If any of these elements are absent, don’t buy the cigars. Do not accept strange justifications, reaching rationales or outlandish stories of backdoor channels through factory employees. Behikes don’t come in bundles in either. You’ve heard it before, but we cannot reiterate this enough: buy your Behikes from a reputable source. Real Behikes are not sold on the beach for $10 apiece. Also, look at the bands carefully and be sure that they have all the lustrous dimension of a high-quality 3-D hologram. It should be noted that the new labels have only recently been put into circulation, so old and new bands will coexist in the market for a while until old stock runs out.